Kamweti Forest is Located at the slopes of Mt Kenya and still part of Mt Kenya in the less known route to the summit of Mt Kenya the Kamweti route. 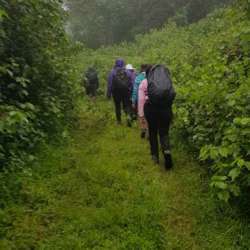 The trail will take us through the rain forest with variety of tree and bird species through Kamweti Camp, one of the Camps to the various Mt. Kenya Peaks using Kamweti route. A detour on ascent will reward us with the beautiful Ford water Falls as part of the Kathiba River. This will be a rewarding trip out of the city, come experience the calmness ,sounds and the feel of the forest. Time: Approximately 6 hrs walk depending with our pace.